Formulated to complement PRO PAC® superpremium dog food, Nut'R'Nipz™ have a savory peanuty flavor blended with oatmeal, apples, blueberries, carrots, and peas. Baked with a unique roasted peanut glaze, these superpremium dog biscuit treats will have your favorite pooch wagging wildly for this special recipe. Naturally preserved, oven baked with the highest quality ingredients, and packed in a resealable pouch locking in freshness and flavor. 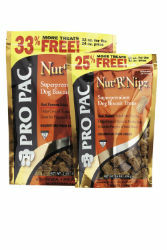 Feed your dog PRO PAC ® Nut’R’Nipz ™ biscuits daily as a treat to supplement his regular maintenance diet. Provide plenty of clean, fresh water daily for your dog. Wheat Flour, Chicken Meal, Oatmeal, Chicken Fat (preserved with mixed Tocopherols), Ground Roasted Peanuts, Molasses, Garlic, Dried Apples, Dried Blueberries, Dried Carrots, Dried Peas, Natural Flavoring.